A completely printable bowstring-style equatorial sundial, adjustable for either hemisphere and a large range of latitude. Print the equatorial band, the bow, the base and the north and south caps. 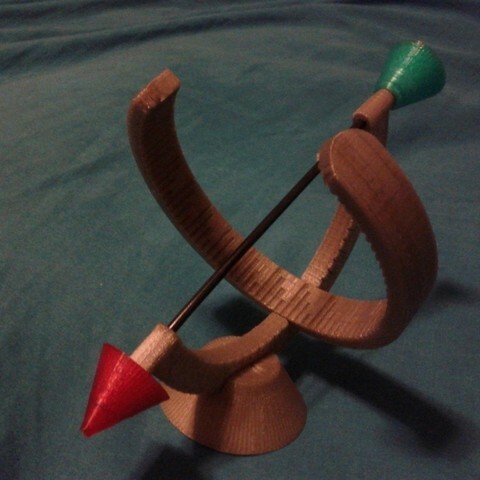 Use a 3 mm rod (filament or a kebab stick works well) for the gnomon, install end caps, attach equatorial band with the middle hour mark (noon mark) aligned with the centre of the bow. Make sure to install the band into the bow to match the direction of shadow advancement with time. Insert bow into base, use the scale on the bow and the mark on the base top to set the inclination of the gnomon for your latitude. Use a compass and the local magnetic declination to point your sundial north/south. Enjoy! The conical caps are hard to print perfectly on most printers, if you prefer you can omit them and use the alternative bow (with no extensions to support them). If you use smaller filament, or wish to use a fine wire for the gnomon you can adjust the geometry in the OpenSCAD file and regenerate. Similarly if you are very close to the poles or equator you may wish to alter the gap in the band based on the earliest sunrise and latest sunset for your location. You can compensate for your longitude relative to your timezone by positioning the band off centre up to one hour mark. This can also be used to compensate for daylight savings time, but as there are no digits on the scale you may prefer to just make the adjustment mentally. Naturally you'll need to compensate for the Equation of Time variation over the year, but the calibration marks are only to the nearest quarter hour and the maximum error is about 20 minutes... There is also no compensation for atmospheric refraction, but the device is too small for very high accuracy anyway. Darker opaque colours are the easiest to read. Darker colours may also be more UV stable if you are going to leave your sundial outdoors.